It's a big week in The Climbing Works. 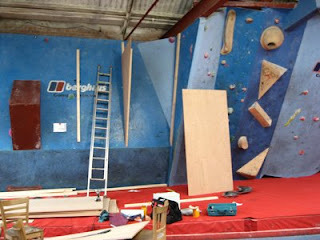 We've got new walls going up, maintenance and R3 of The Climbing Works Berghaus Bouldering League. Monday morning started with Sam & Percy in the toilets doing a little bit of maintenance. For those who think that being the owner of your own Bouldering Wall is all glitz and glamour & travel abroad...think again. First thing Monday morning getting involved with smelly toilets is not the best start to the week. After that, we got our delivery from Lavers of ply which got Percy very excited as he could use his new tools. The slab on the Â competition wall is the first bit to get worked on with it being back open for Friday's comp. The next few days will see a bit more work done on another wall but we'll let you know as that happens. So alot of work going on this week cumilating in R3 of the Winter Comp series this Friday. With some new walls to play on it's going to be a good one.